On Wednesday, a Staten Island grand jury decided not to indict Officer Daniel Pantaleo, the cop who put Eric Garner in the chokehold that precipitated Garner's death in July. The medical examiner declared Garner’s death a homicide in August, and the entire encounter was caught on tape, inspiring protests across the country just a few short weeks before Officer Darren Wilson would shoot and kill an unarmed Michael Brown. Last week, a grand jury in Missouri similarly refused to indict Wilson, who is white, for shooting a young black man. Garner’s case has often been referenced in the same breath as the tragedy of Mike Brown’s death: Two deceased black men, their deaths were caused by white officers who walk away without consequence. But one crucial detail sets Garner’s case apart from that of Brown’s: there was a video. A crude video filmed on a cell phone captured the entirety of Garner’s encounter with the police, from the initial approach up through his final breaths on the Staten Island sidewalk. We can see Pantaleo throw an arm around Garner’s neck and drag him to the pavement. We can hear Garner repeatedly call out, "I can’t breathe, I can’t breathe." We can watch Pantaleo refuse to loosen his grip. And yet, this video — tragic, traumatic, damning as it is — was not enough for a panel of up to 23 people to say yes, Pantaleo might have done wrong, this warrants a fair hearing. In Michael Brown’s case, some argued that the grand jury’s inaction was due to conflicting stories or facts. With Eric Garner, we can no longer pretend that our criminal justice system is race-neutral. The video is there. And it was not enough. After Michael Brown’s death, many advocates, including President Barack Obama, came out in favor of body cameras for police forces. A petition to the White House for a "Michael Brown Law" that would mandate police officers wear body cameras garnered more than 154,000 signatures. The logic went something like this: if we can verify what happened, if we can show clearly how white officers are interacting with men and women, then we can identify bad behavior and we can hold the perpetrators accountable. 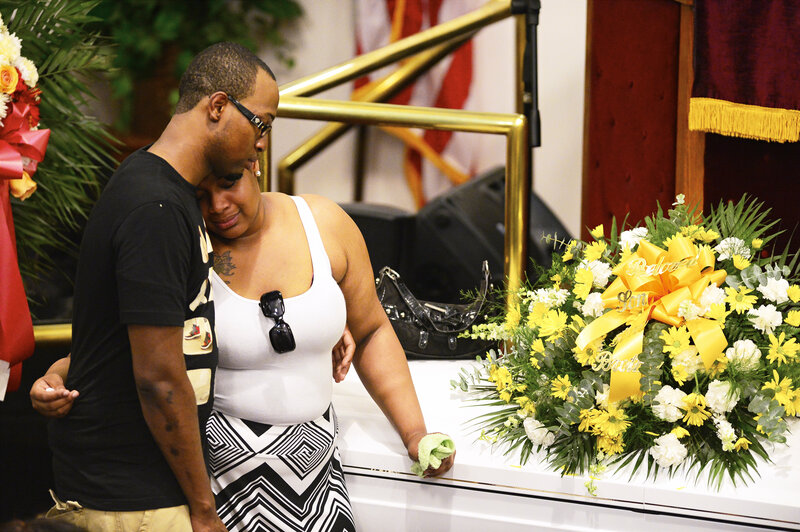 Eric Garner’s death shows that mere body cameras are not enough. And that’s because the problem of racial profiling and police violence – as communities of color have long known – has never been simply a matter of proving it exists. Just because the white community can see how people of color are discriminated against, targeted and killed by police officers in disproportionate numbers — Pro Publica tells us that black men are 21 times more likely to be shot by a cop than their white counterparts — doesn’t mean that we have convinced the white population that this racialized violence and dispossession is wrong. Darren Wilson argued that his use of deadly force was justified because Brown was a threat that had to be neutralized. The members of that Missouri grand jury must have found that explanation legitimate. Much remains to be written about and distilled from the grand jury’s deliberations over Eric Garner’s death. We don’t know yet how that jury panel became convinced that Pantaleo’s chokehold — a move banned in the NYPD — was a legitimate response. Or how they decided that Pantaleo’s refusal to let go of the chokehold even as Garner complained he could not breathe was legitimate and did not warrant a fair hearing. We need to strengthen the accountability mechanisms for police departments to ensure that officers who use unjustified force are actually investigated rather than allowed to testify directly to their side of the story before a sympathetic grand jury panel. And as a community, we need to be conscious of and opposed to the ways in which our police forces target, marginalize and threaten people of color. Driving while black, stop and frisk, aggressive and violent responses during interactions with black youth — these racial profiling tactics tell people of color that you do not belong here in our communities, and you never did. Neither you nor your children will be safe here. So yes, putting body cameras on police officers is a first step. But the path towards a fair and equitable treatment for people of color at the hands of law enforcement and the courts will require much, much more of us. The grand jury’s decision in Gardner’s case is, after all, an indictment. It is an indictment of our criminal justice system, and it is an indictment of all of us who continue to mistake the trappings of a justice system for the truth of justice being done.